While some may think that Saturday mornings on a college campus are as quiet as a dorm full of slumbering students, Saturday is often full of excitement and magic. The reason is college football, where the weeklong buzz about the upcoming game turns into Friday-night revelry. The enthusiasm culminates as the ball is kicked off Saturday morning. Those who aren’t part of the campus action need not miss out. Since 1987, ESPN’s College Game Day has served up three hours of pregame coverage focused on victories, defeats, heated rivalries, playoff implications, and outlandish ways fans cheer on their teams. Considering the hoopla that surrounds college football, it’s no surprise that #CollegeGameday and #Gameday are popular hashtags used to update fans in real time and generate a virtual rally cry. While anyone can enjoy college football, we wondered which teams digitally dominated the turf – specifically on college campuses – and pondered whether a team’s on-field successes matched student excitement. Are people near college campuses just as charged up about teams that don’t perform as well? We turned to posts (within a one-mile radius of many campuses) on Twitter and Instagram that used hashtags #CollegeGameday and #Gameday to find out. Here’s what we discovered. We wanted to get a sense of what sports people were most hyped about on Twitter and Instagram, so we looked at hashtags most used with #CollegeGameday and #Gameday per state. 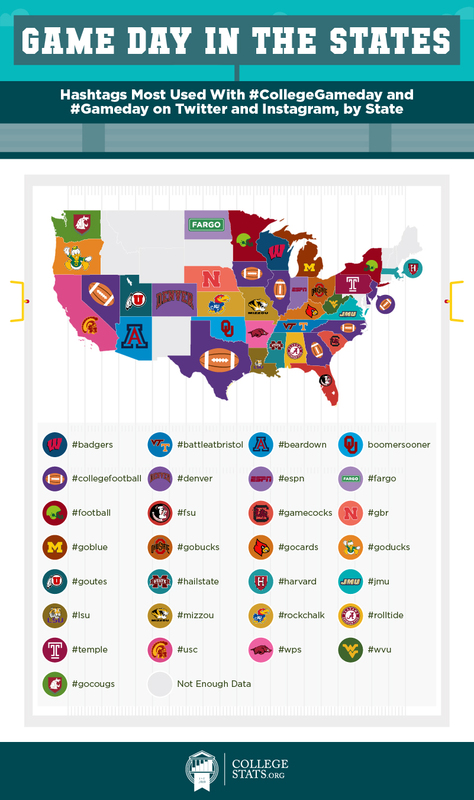 It turns out, #collegefootball dominated as a hashtag in Delaware, Nevada, Texas, Iowa, Illinois, Georgia, North Carolina, and New Jersey. Team-specific shout-outs and #football were also popular in posts. The only notable exception was Indiana, where #ESPN took the lead. The take-home message is that excitement surrounding college football isn’t just fun and games. Being nationally followed and having televised games helps a strong football team build name recognition for their college. Some students will even select a college to attend because they’ve grown up following its football team. Big school? Winningest team? We wondered if these factors corresponded with the most school spirit. It turns out, they don’t. Dukes fans at James Madison University shared #Gameday and #CollegeGameday on Twitter and Instagram more than any other school. JMU is nowhere near the largest U.S. school regarding full-time undergraduate enrollment. With about 21,000 students, they’re not even in the top 100. However, what JMU does have is a ton of school spirit – possibly because the Dukes have such an adorable mascot, the Duke Dog. Everyone loves a bulldog. The Michigan Wolverines have the most all-time wins and the highest winning percentage in the history of college football, so we suspected Michigan would be in the top 10 schools for most mentions. However, they weren’t. Auburn University had the second most mentions of #CollegeGameday and #Gameday, just above Alabama University. The two are bitter rivals, each hosting the annual meetup known as “The Iron Bowl.” A victory in this matchup is Instaworthy and totally tweetable. 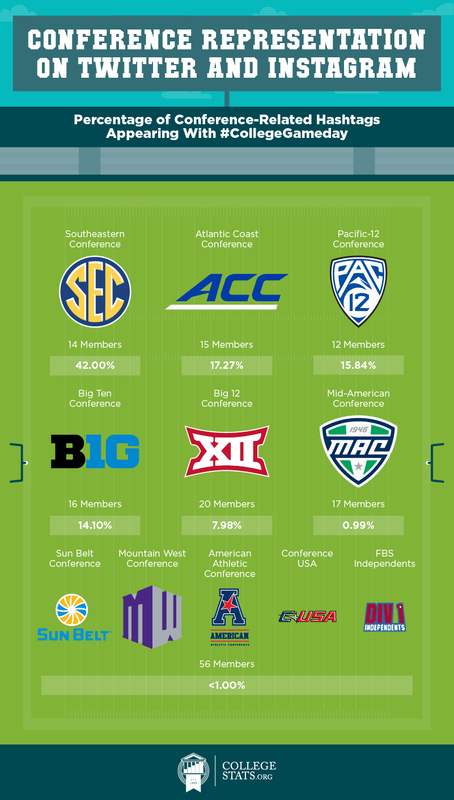 The college football teams that play against each other is largely determined by conferences. Teams typically play most of their games against other teams in the same conference. So naturally, fan loyalties are forged around them. It’s not just about your own team winning, but also about staying on top of which team is trouncing your rival. Pundits usually credit the Southeastern Conference (SEC) with having the best college football can offer. Some of the country’s most competitive programs – like Alabama, Arkansas, Auburn, LSU, Tennessee, Texas A&M, Ole Miss – are members of the SEC. Given their large student bodies and the quality of football leading to national exposure, it’s no surprise that over 40 percent of all the tweets that included a specific conference hashtag used #SEC in addition to #CollegeGameday. In Saturday Twitter and Instagram posts, #Football was most tagged expression along with #Gameday, while college football was the favorite associated with #Gameday, indicating that when it comes to sports, it’s football above all others that generates serious Saturday excitement. 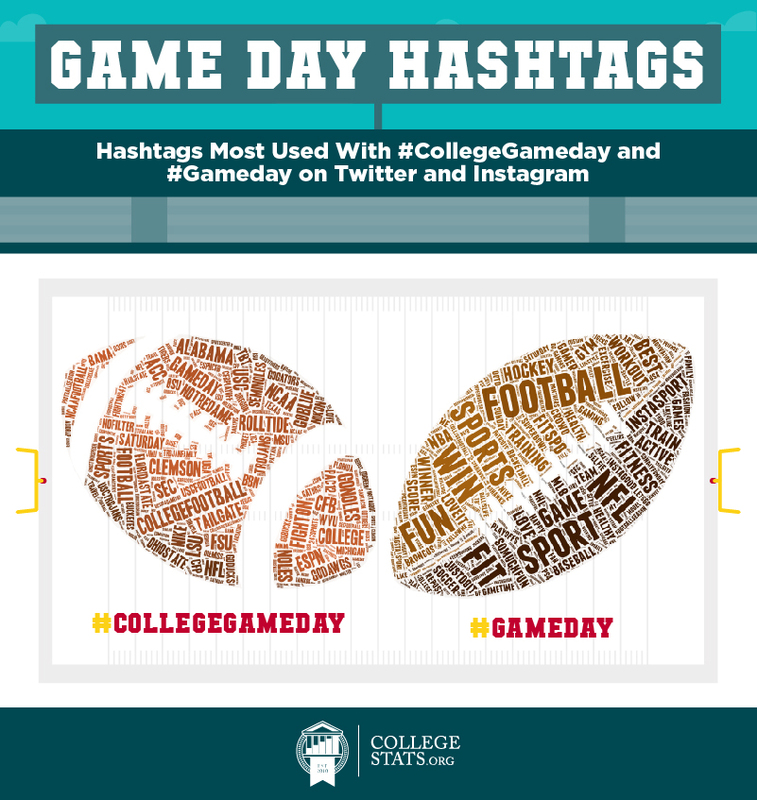 Tags such as #Sport, #Win, #Fun, and #Love were the most commonly used, whereas tags used with #CollegeGameday posts tended to be more specific. #Gameday might be any day a game is scheduled to play, regardless of the sport, but the #CollegeGameday hashtag encourages a great online dialogue about pregame traditions, mascot antics, and upset watches taking place on Saturdays. 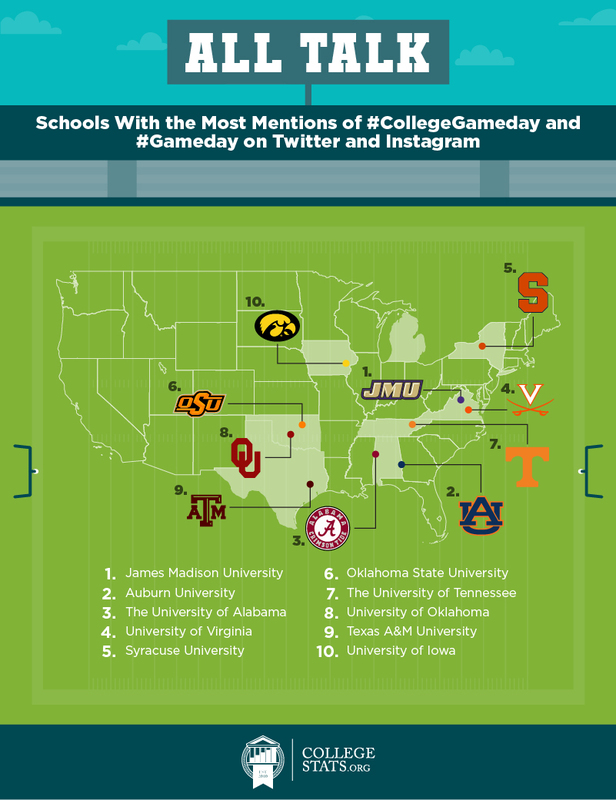 It was also more common to see specific schools called out in addition to the #CollegeGameday hashtag. When it comes to team pride, Seminoles fans are at the top of the list. 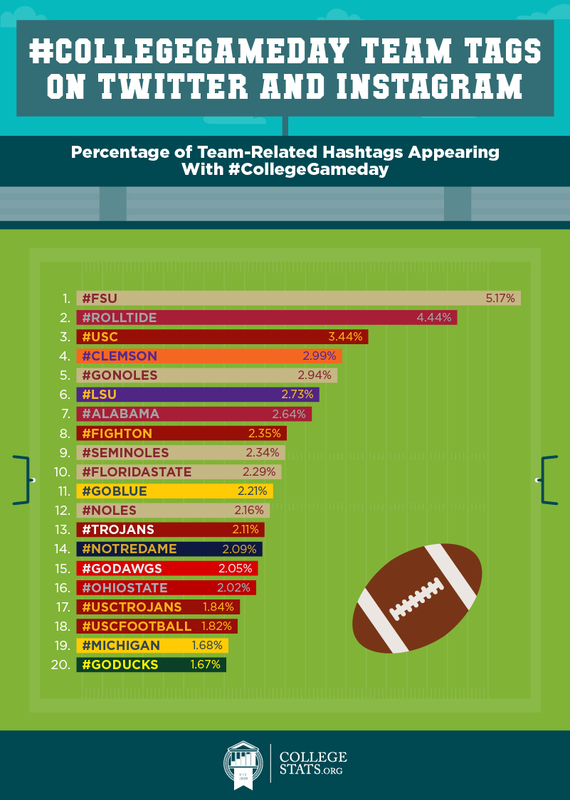 Florida State University fans used team-related hashtags used most commonly with the #CollegeGameday tag. Not only does Florida State University own the top spot, with over 5 percent of tweets and Instagram posts we reviewed carrying the #FSU tag, they also have three other team-related hashtags in the top 10: #GoNoles, #Seminoles, and #FloridaState. “Roll, tide, roll” – the rallying cry of the University of Alabama’s Crimson Pride came in a close second. In fact, Alabama and USC were the two other colleges with multiple team-related hashtags in the top 20: #RollTide and #Alabama for the Crimson Tide, and #Trojans and #USC for University of Southern California. Where do passionate fans come from? They attend or attended a school, or they grew up supporting a school’s athletics program via strong family ties. Whether it’s the Auburn Tigers, Florida State Seminoles, or the Ohio State Buckeyes, fans of each college team love to have their voices included in the global conversation on game day. Still, Saturday is only one day of the week – for more on the other six days and college experiences, head to CollegeStats.org. We scraped Twitter and Instagram for posts containing #CollegeGameday and #Gameday. And sorted posts coming from at most one mile of a college campus. We disqualified colleges in mid- and large-sized cities because including them would greatly decrease confidence that a particular tweet came from on or near a campus. When ranking both Twitter and Instagram together, we normalized the rankings of each social media outlet due to the larger number of Instagram posts scraped. Adding them together would represent only the Instagram rankings and not accurately show how a school was represented on Twitter. For associated tags, we looked at the text of every post to see the frequency of all hashtags used within the post. A team of researchers manually went through and found the top school- and conference-related hashtags.